Hazardous areas require special attention from specifiers. These are areas, as defined in the National Electrical Code, where a combustible atmosphere raises a risk of explosion if sparks or open flames or present. This risk could be the result of flammable gases, combustible vapors, combustible dust or easily ignitable fibers. “Explosion-proof” can be easily confused with “intrinsically safe,” another term frequently seen in specifications for hazardous locations. Intrinsically safe products are designed to eliminate all possibility of ignition in dangerous settings. 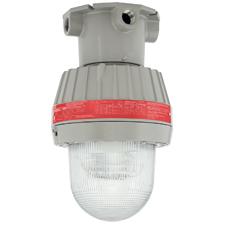 Explosion-proof lighting, enclosures, and other electrical products are, instead, designed to keep any ignition that occurs within the device from spreading. So, the goal for the designers of explosion-proof offerings isn’t to keep the surrounding, flammable atmosphere out of devices and enclosures. Instead, devices and enclosures are expected to be able to contain any resulting explosion within themselves, without rupturing. The goal is to prevent any kind of ignition within a device from cascading into a much larger explosion in the surrounding area.